Growing up poor the word glamorous didn’t even enter my life until high school. I wasn’t yet the word nerd I am now (I know I don’t exactly use my love of words here, wev). Later when the fantastic British comedy Absolutely Fabulous came into my life, I was suddenly obsessed! I bought a metallic silver mini backpack that I wore as a purse for ages! I would wear the weirdest jewelry and shoes! I felt at the time that I was somehow emulating those glamorous women when in fact I was laying the foundations of my own quirky style! I sourced much of my stuffs from Ross (Dress For Less) and the Contempo Casuals Outlet that I worked at. I also see a hint of what I have found myself doing now which is adding a touch of glam to every day. No matter what I’m wearing or what I am doing I try to add just a little something to make me feel good! I don’t know, I suppose it’s useless or silly to some, but they underestimate the value of silly! Woo! I’m sure some of you have noticed my increasing use of fancy-fucky headbands, this was the reintroduction of glam for me most recently. My collection has grown! Ha-ha! But then rather than a typical blag wrist-let, I went with the silver bangle style. Glam! Instead of my usual “dress docs” (Doc Marten’s I wear to dress up things) I wore my black patent leather shoes with the cutie side bow on NYE! There is something about that little touch of glamor that make me smile. 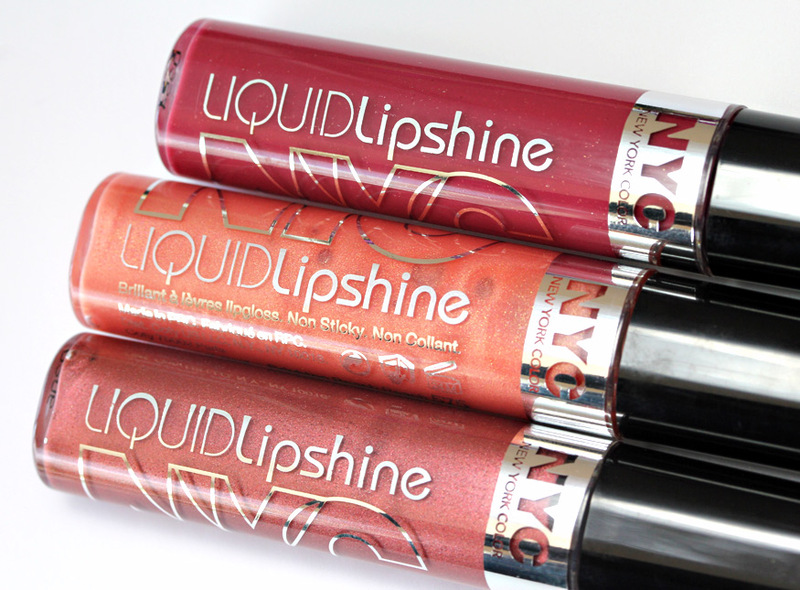 The other thing I’ve been enjoying is NYC Cosmetics Liquid Lipshine (click the pic for the link). My friend Jeanette talked me into buying the Midtown Mulberry and I use it almost every day now! It smells like vanilla cupcakes or that raw sugar lotion from bath and body works. It’s just yummy and the color is perfect for me! Even if I’m not wearing any other make up I will slap some of this gloss on and feel FABULOUS!!! What bit of glam do you add to your daily routine? Do you rock a hair bird or giant flower barrette? I’ve been wanting to try the new nail stamping things, but haven’t truly committed to it yet. I know I have readers who love that stuff. Please recommend a good, beginner and affordable kit or something I could put together myself, perhaps. What other glam things should I check out? Lay it on me! You know that I luv to rock the giant (or even not so giant) cocktail ring. Even today when I am wearing jeans and a simple grey cotton shirt, I’m rocking a ring. It makes me feel fabulous and adds just that little bling or fancy to my outfit that doesn’t take any fussing…like hair. I’ve built up quite a collection and have acquired most of them at the Avenue. I try to buy when they are on sale and I would say I would rarely if ever have paid more than $10-12 for one. I’ve made a couple myself from large wire wrapped crystals and picked up an awesome elephant head one at World Market. Too bad I can’t post a pick here…one of my favorites is this over the top (almost gaudy) floral design with surrounding cut glass in bright colors. I nearly didn’t buy it (as you know) but found it too irresistible not too. Ill email you the pic if you want to post it! For me it’s usually earrings, a flower hair clip, and some kind of lipwear-I have a drawerful of it, but am still totally gonna steal that gorgeous lipshine! NYC is cheap, and our local Fred Meyers is almost always rocking a BOGO coupon. Thanks for this delightfully girly post Sarah, it brightened my day! I have three glam things that I do all the time: animal rings, hats, and nail polish. Hats have been my signature since I was fifteen. In fact, I just added an awesome vintage wide-brimmed winter white hat with red ribbon trim to my collection, thanks to some very wonderful friends who thought of me when someone’s great aunt was downsizing recently. Rings started in my late twenties with Wilbur. He’s the pig I wear on my right pinkie. In addition to Wilbur, I have Kermit (my frog engagement ring), Octavia (a spectacular octopus complete with lifelike suckers on all the tentacles, even where it won’t show), and Leppo (a fabulously detailed leopard). I love critturs, I love silver, and I love having something dramatic on my fingers, even when I don’t on my fingertips. Funnily enough, nail polish was the last to take root and is most frequently found on my toenails. I do polish my fingernails, too, but since I bake a lot there are times when it simply isn’t at all sanitary to have nail polish on. But my toenails are glittery gold as we speak. So it isn’t world peace. It’s good for the self-esteem and it isn’t hurting anyone. Glam is good. The three things I always do, even when I’m just going to the corner store to get some milk, is curl my eyelashes, put on mascara and lipstick. I wear a little more makeup (face powder, and usually neutral eyeshadow) when I’m at work, but lipstick and mascara have always been my “things,” the glam I have to have to make me feel more like *me*. I got into makeup at age 14 when I finally had enough allowance money to buy my own, and I just fell in love with it. I’ve tried every kind of makeup under the sun – eyeliners, eye shadows, eye crayons, powder and cream blush, every shade of lipstick and lip gloss I could find, and every kind of foundation and face powder. I wore so much foundation in high school, I gave new meaning to the word “cakeface” (heh). After years of trial and error (a LOT of error), I finally found what works for me. These days, it’s much more minimal than the stuff I did in high school. And I realized in the choice between lipstick and lip gloss, I’m a lipstick girl. I love lipstick and the color saturation it gives. Lip gloss just doesn’t have the color saturation I like, and I don’t like the look of very shiny, glossy lips on me. But I never quite feel like my best self without some color on my lips. And once I get some lipstick on, I like to emphasize my eyes with some mascara. I’m not into the super long “false lashes” look that seems to be the fad right now; I prefer a more natural look. But I feel kind of naked without at least a little mascara to give my eyes a little more emphasis. So those are my “things,” my bit of glam, and I don’t see myself giving them up any time soon. thirtiesgirl: I prefer a more natural look too. I think I would prefer lipstick for the color saturation, too, but never seem to find the right colors for my complexion. I guess glosses are a bit more forgiving in that way. But I love the new lip stains that are out right now, too. I’ll have to pick your brain more about make up! I think lip glosses look better on blondes and more light complected people. I also think blondes and fair haired/fair skinned people can look great with red lipstick, too. Not as an everyday thing, unless you like to look extra glam every day, but for special occasions, it looks great. A russet-red shade would probably look great on you. You’d look great in peachy-rose shades and rosy-brown shades, too, for more everyday lipstick.